This is a subjective list of things I like, that help me and might be helpful for you in a number of different areas. For food and cooking related links, please see the Resources page. Ecoplum: environmentally friendly products and trusted green information. I write a monthly column for them. Speakery: Genius Gary has been such a help with this website, SEO optimization and social media. WPO: Without this amazing group of women, none of this might have come to be. Fifth Avenue Digital: Corporate and event photography. Like my headshot? They did it. Tour de France Group: One of these days when I’m eating local it’s going to be in France…Marsaillesis a great pre-theater place. Telepan: Chef Bill Telepan is a big believer in local, fresh and sustainable, and he’s a great chef to boot. Serevan: Chef Serge has a way with local foods, and is happy to share recipes and techniques. This is one of our favorite weekend haunts. 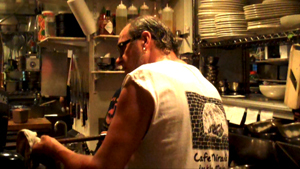 Cafe Miranda: Sit at the bar and watch Kerry and his crew cooking almost everything in a wood burning oven, here’s a quick clip of him in action. An almost overwhelming menu of amazing food. If they ever came to New York, I’d never cook again.